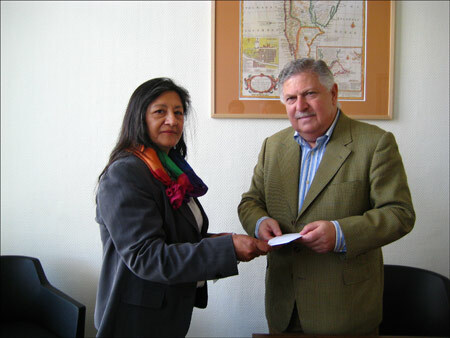 Chile President Receives UNPO & Mapuche Letter of Concern. Mapuche and UNPO representatives met with the Netherlands Chilean Ambassador ahead of a three day visit from Chilean President, Michele Bachelet, in order to discuss the current concerns of the Mapuche in Chile. On Saturday 23 May 2009 Mapuche representatives led by Mr. Rafael Railaf and joined by Ms. Maggie Murphy of the UNPO held a meeting with the Chilean Ambassador, J. Martabit, in The Hague, the Netherlands. It was used as an opportunity to discuss the key concerns of the Mapuche people, the largest indigenous population in Chile. The delegation also presented a letter to the Ambassador for the attention of the President, Ms. Michele Bachelet. The letter highlights the economic, social and cultural concerns of the Mapuche and draws attention to a number of political prisoners. A copy of the letter in Spanish can be viewed here. The Mapuche make up around 10 percent of the 15.8 million of Chile's inhabitants. They are the largest of the indigenous peoples of Chile. The Mapuche are among the poorest and most marginalized groups in Chilean society and the rural Mapuche population lives in conditions of poverty. Among the Mapuche population, 34.8% are situated below the poverty line; 52.3% of the Mapuche population are considered poor in the Bio Bio region. The human development index of the Mapuche population is one point lower than that of the non-indigenous population and the average Mapuche income is less than half that of the non-indigenous population. It is recognized that the recent ratification of the International Labour Organization (ILO) 1989 Convention by the Chilean government is a definite step in the right direction with regards to indigenous rights. However the Chilean government still does not recognize the Mapuche as a Nation. The "recognition" is only a level of cultural identity and it seems more a political and legal effort to support the assimilation of the Mapuche in the context of the Chilean nation as "one and indivisible". The Chilean government also uses the strictest legal regime possible against the Mapuche was raised in the discussion and the letter. The use of an irregular law - created by the military to suppress opposition to the Pinochet dictatorship - has been widely condemned by a range of individuals and organizations, including the former United Nations Special Rapporteur on the situation of human rights and fundamental freedoms of indigenous peoples, Rodolfo Stavenhagen, Amnesty International and Human Rights Watch. Ms. Michele Bachelet, who leaves the Netherlands at 27 of may, had addressed the issue of Chilean political prisoners in an interview that can be watched here. She claims that there are no Mapuche political prisoners in Chile, and no one is imprisoned for their ideology or ethnicity. She claims she is very respectful of the Mapuche, and indigenous groups in general. However, Mr. Rafael Railaf countered this statement, stating that the Mapuche do not promote violence, in many cases there has been used brutal violence against them en that many have been imprisoned solely for being vocal about political representation in Mapuche regions. "It is not a crime to stand up for your people, religion and land", Mr. Railaf stated. The UNPO and the Mapuche diaspora in The Netherlands await a response.